Win a Pair of Wine Diapers! Pretty cool, huh? These are called "Picnic Stix," and they are wine holders that come with stems that you just stick into the ground at the park...the beach...wherever you happen to be imbibing! Your wine doesn't tip over AND you look very cool drinking it. 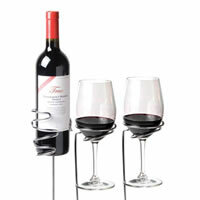 So what fun wine gadgets have you come across? Let me know between now and November 23rd. I'll pick my favorite, and the winner will get 2 free Wine Diapers! 1) Ignore the traditional wine-pairing rules of the other 364 days of the year (red wines with roasted meats; light whites with salad). Forget about every food that's on the Thanksgiving table, actually. "All these rules have pigeonholed creativity," he says. "It's OK; try different things. Have fun with it, don't be intimidated by it." 2) Thanksgiving is a long day. So, if you're going to be drinking wine, be sure to pick varieties or styles you know you can drink all day--in other words, wines that are lower in alcohol and lighter in weight.Very good point! That is, unless you're going for the drunken stupor, which, depending on your family, can be a good idea. So what's your favorite wine to have with Thanksgiving dinner? Emeri...one of my new faves. This wine is great! They make fun wines that sparkle and are pretty. My preferred one is their sparkling Sauvignon Blanc. Yep. A sparkling Sauvignon Blanc. These are feminine, summery wines, and ladies--you'll love them. Even better? They're priced well--under $15 a bottle. Oh how I long for a glass right now, had on my back deck under a summer sky...but alas, it is November, and I have no Emeri. In the metro Detroit area, you can pick up a bottle at Simply Wines in Birmingham. What is The Wine Diaper, Anyway? So just what is this Wine Diaper? Well, imagine this. You've just spent an awesome 10 days gallivanting around Italy, soaking up sun, eating too much pasta...and drinking great wine. In fact, you want to bring some home! So you pick up a couple of bottles, wrap your nice cashmere sweaters around them, stuff them in your suitcase, and jet home. Alas! When you get there, you discover one of your bottles has broken. Red wine is everywhere. 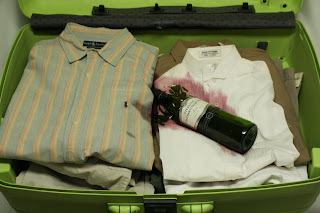 Not only have you lost your wine, but your sweater is ruined...in fact, ALL of your clothes are ruined!! I used to travel a lot back and forth from Europe, and this has happened to me, and to many people I know. In my search for an answer to this problem, I came across a piece of advice that claimed that baby diapers were a good solution for packing wine. 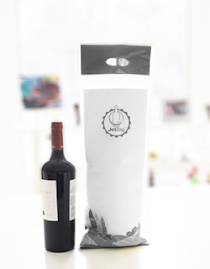 They'd help pad them, and if a bottle broke, the absorbent material would soak up the wine. I wondered if there might be a way to make a baby diaper into a "wine diaper." Ten years later, and I've constructed this. Visit my website, try one out! They're meant to help save you a ton of headaches when you bring home wine. The Wine Diaper is Blogging! Well, Happy November everyone. As the Wine Diaper picks up speed as a new product, we wanted to create a daily blog related to all the things we love...namely: wine and travel. Here you'll find tidbits we come across about great wines, great travel, Italy, and of course...updates on the Wine Diaper. So we hope you'll stop in, browse around & leave some comments. Happy Travels...wine safety first!